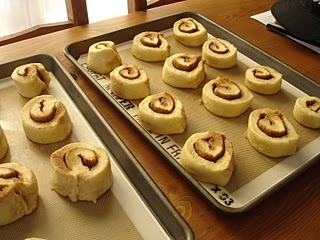 While I was perusing my usual batch of food blogs, I noticed that quite a few had made cinnamon or sticky buns. After a bit of reading I discovered that there is a food blogging group called The Daring Bakers, and each month they set a challenge for themselves- i.e. mirror cake, caramel tart or, like this month, cinnamon or sticky buns. 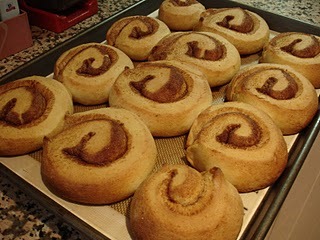 After seeing photo upon gorgeous photo of the sweet, swirly buns, I decided to try my hand at them as well. And lucky me- most of the bakers had used a recipe from Peter Reinhart’s The Bread Baker’s Apprentice, a book I own and love. I got to work and quickly decided to make a double batch so I just doubled all of the ingredients in my head. 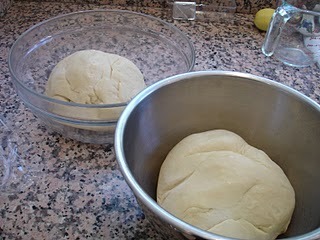 Everything came together quickly, but as I was kneading the dough, I just felt it wasn’t right. I’ve kneaded a decent amount of dough in my time and you can literally feel it coming together in your hands, turning from a tacky, sticky mass into a smooth and shiny ball. Somehow, that wasn’t happening, and the dough was so tough. I checked the recipe again and realized my big mistake- I’d doubled everything but the milk- so there was double the dry ingredients and only one part of the wet. Great. I tossed the dough balls out and started all over again. 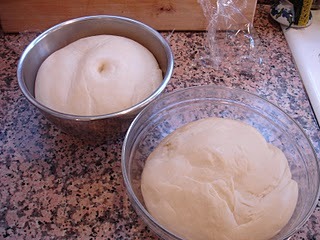 The second mass was easy to knead and came together just as I described in the previous paragraph. After about ten minutes, I had two, smooth balls of dough which I nestled in some oiled bowls, covered with plastic wrap and a towel and set outside on the patio since the weather was nice and warm. After about 90 minutes, both were puffed and doubled in size, so I got to work on mixing up the cinnamon sugar and rolling out the dough. Here’s where I made another sort-of mistake. Normally, I’d punch the dough down before rolling it out, but the recipe didn’t say to do so and I simply rolled out the puffy balls into rectangles. 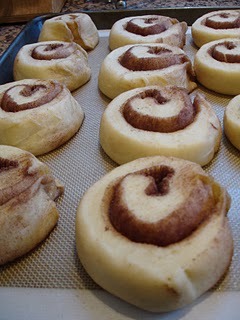 After liberally coating each with the cinnamon mixture, I rolled them up……and a lot of the sugar kept pouring out of the ends. It made quite the mess but I soldered on…….and finally cut the rolls into, well, small rolls, let them rest again for about an hour. After they had puffed up nicely, I baked them in the oven and the entire house smelled like sweet spice. The rolls swelled even more in the oven and they looked really good. I let them cool for a bit and then drizzled the fondant icing over each one. The verdict? 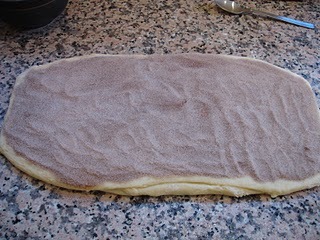 Well, I was wondering how I could have fit all of the cinnamon sugar onto each dough rectangle- it seemed that there was way too much sugar to dough, which is why a lot of the sugar fell out while I was rolling. I emailed Fanny, whose cinnamon rolls looked absolutely perfect in her post and she pointed out that I should let the air out of the dough before rolling it out, making a bit more room and also giving the dough more elasticity for the sugar to cling to. Next time I will definitely have to do that. 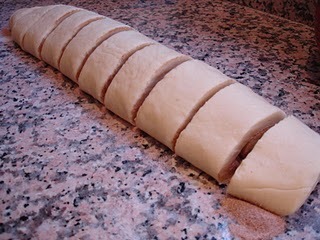 I was also thinking that I might try and make a cinnamon paste of some sort so I can spread it onto dough. I also found the rolls to be a tiny bit on the tough side, even though I kept the rolling to a minimum. I think my choice to use all butter instead of shortening (the recipe calls for either or) may be the culprit. Next time I’ll try using butter flavored Crisco since shortening contributes a certain tenderness to dough that butter just doesn’t. Overall they tasted and looked good- I guess I just want something that is so time consuming to be perfect!! I’m looking forward to making them again and am glad I made the attempt. 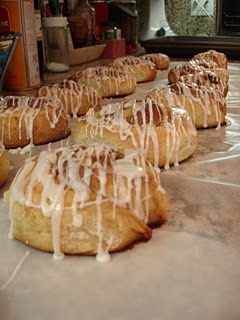 This entry was posted in Cinnamon Rolls, Pastry, Peter Reinhart, sweets. Bookmark the permalink. hi – those look delicious! 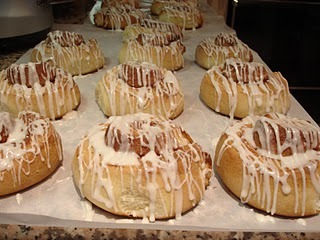 i’ve tried various cinnamon roll recipes over the years, but have yet to get them just right. you’ve inspired me to to try again – thanks!